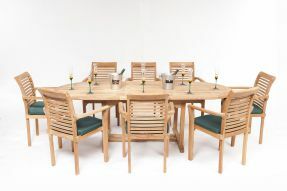 Be the envy of your friends, neighbours and family, invite them along to share food and drinks in your garden with the Monte Carlo Oval 8 Seater Outdoor Teak Garden Furniture Set. The Westminster bench's classic, truly British design makes it the perfect choice for any outdoor space either as a garden bench or a memorial bench in a park. Best Price Guaranteed! Seen it cheaper? We'll match it instantly. 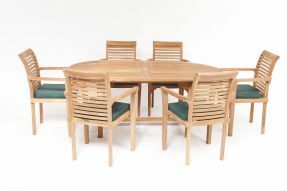 We are proud suppliers of Teak Garden Furniture to the Royal Sandringham Estate and Eton College. 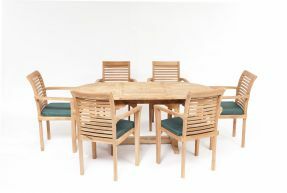 Our furniture has been recommended for value by "The Guardian" Newspaper, featured on "Moneysavingexpert" and used as prizes by McVities biscuits. 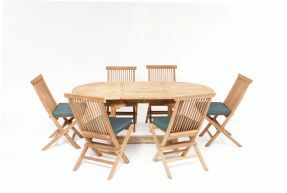 With over 25 years of experience selling teak garden furniture, we are a family run business. 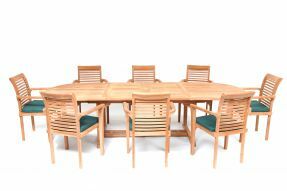 The relationship we have with our factory in Indonesia and the huge amount of quality top grade SVLK certified teak garden furniture we sell enables us to to pass on huge savings to YOU, the customer. We 100% guarantee quality top grade garden furniture at affordable prices; not only is our teak garden furniture beautiful to look at and enjoy, it is also extremely functional and will last for years. We deliver to both retail and trade customers, call our hot line on 01482 640409 or contact us via email.